Spider-Man on PS4 is available to buy now. So, you're probably looking for the best prices on Spider-Man, searching for a good deal, and maybe trying to find some of those limited editions (warning, people are selling them for INSANO prices - some joker is trying to flog one in the UK for £1,490). Heck, maybe you're even still looking for one of those LOVELY Spider-Man PS4 Pro consoles, which seemed to sell out in seconds. After all, the game has been widely hailed as another masterpiece for PS4, and continues Sony's run of excellent PS4 exclusive games in 2018. Our expert reviewer, Leon Hurley, finished the game to 100% and has concluded that it's "as good as superhero gaming gets", which is high praise. Our Spider-Man review awarded the game 4.5 out of 5, praising the excellent freedom of movement, the movie-like story, and the wealth of things to do. If you're looking for value for money, this game will probably take you about 35-40 hours to grab the Platinum Trophy, with the main story clocking in at around 20-25 hours. That's probably about the same as Sony's other 2018 epic, God of War. Below are the best prices for the standard edition, which you can buy RIGHT NOW. We will update this feature if the Limited Edition consoles and Collector's Editions come back into stock. 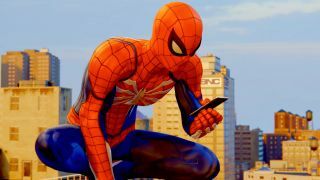 What are the critics saying about Spider-Man PS4? "A fantastic experience that completely absorbs you into its unique slice of the Marvel universe" says Gamespot, awarding a 9. First off, the 1TB PS4 Pro console with Spider-Man is available at time of writing. It's an actual limited edition console, with red coloring and a sweet spider logo on the top. The pad is styled too, in red and white. You get a 1TB (standard) HDD, and you can pick it up for the same price as a normal Pro. So everyone's a winner. If you can't find a Spidey console, check out the best PS4 bundles on the internet. There is, of course, a Collector's Edition of the game. Included here you get a Spider-Man statuette, a Steelbook case, an artbook, and a spidey sticker. You also get access to all the game's post-release story content called 'The City That Never Sleeps' - which means three new story chapters, extra missions, suits and characters. If you pre-ordered it you also get a special suit, some extra gadgets, and some skill points. Lucky you. In the US it was available via Amazon. In the UK, it was sold via GAME. Buy it UK - £1,490 from Amazon (Ahahahaha) - I mean, this is robbery. Actual robbery. If you missed out on the Collector's Edition, but still want the in-game goodies... well, this is the closest you'll get. The 'City That Never Sleeps' DLC is available as a separate download, and you get three new story chapters in here, which is a good chunk of content. You'll also get new suits, story characters, and missions, so it's worth it. If you've got to have the full game experience and you've somehow already finished the story.